You must start on removing / opening the back cover case of Galaxy S III mini from the top side of the phone (where the headset jack located). There is an opening gap that would assist you as the latch to open the cover. Face downward the phone, hold it with your left hand and use your right hand (fingers) to open the cover. Insert your forefinger nail or your thumbnail in to the opening latch, gently make the finger had a grip in there, then pull up the cover. You might heard a sound in this process. Whenever the top sides of the cover is partly removed, continue to detach the side by side of the cover until it's fully removed. Done. If you handed this phone first-hand aka got it brand-new from phone-shop with complete package, you will find that the battery isn't yet assembled. After you open the cover, you'll see three important parts: The SIM card slot locates on the right side of rear camera; the battery compartment, and the microSD memory card slot located on the bottom-right of the battery's compartment floor. See the image for better understanding. We start with the SIM Card. Depend on the region, it might that the SIM card suites for the Galaxy S3 min GT I8910 is standard SIM type; or might be in Mini SIM type. Just choose the suited one. With gold-contacts of the SIM facing downward and the cut-edge on the out-righ (pictured), slide the SIM card to its slot using your finger. Make sure it reaches end of the slot. Done. In case you wanna change your SIM card to other's SIM card carrier, just a bit pull up the bottom side of the SIM from its compartment slot (use your fingernail) then slide it out. Done. If you plan to extend you internal memory (8GB/ 16GB version)with microSD external memory card on this smartphone (whatever the size of the memory, but it limited to 32GB), you must insert the microSD card before you assemble the battery. If the battery is assembled, you must removed first. It's because the memory card slot's located on compartment's basement. Make sure the gold-colored contacts of the microSD is face down, then align the card with the slot and positioned just like the image tutorial we embedded above, then slide it into the slot until it firmly assembled. Done. If the card didn't formatted, you must format the card via Settings > Storage > Format SD card > Format SD card > Erase everything. Remember that you wanna remove the microSD Card, the first step you need to do is unmounnt it: Settings > Storage > Unmount SD Card. Then open the back cover case, remove the battery and finally slide the card out from the slot and pull it out Done. Assembled and replace back cover casing is an easy steps. To assemble battery, all you need to do just make sure the metal-connector on the battery is aligned with the connector of the battery's compartment the push down the battery until it firmly assembled. And to make the cover back to it function on the smartphone (covering the battery and sim card and else), just align the camera hole on the cover with the rear camera, then press down the sides of the cover until it's locked. The clack sound is the indicator that the cover is on its best locked position. Done. 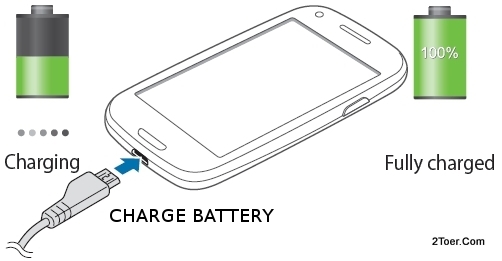 Before we deliver the tutorial on how you can do Hard Reset on this SGS3 mini, let's give you a short tutorial how you can charge the battery used on this phone (Li-ion type with 1500 mAh capacity). Make sure you assemble the battery properly then use the USB cable to charge: on the mini USB head, plug it into the multipurpse jack of the GT I8190 available on the bottom side of the phone's body. Then, you can directly connect the another USB head to the laptop or PC, that would give you a charging process and also can be used to make data transfer. But in the first charge, it's better that you use the Charger Adapter instead via PC. Connect the USB to the Adapter, the plug the Adapter to the Power outlet. Whenever the phone said charged, or the battery indicator is 100%, you must unplug the USB. It means the battery is fully charged. Done. And here the instruction steps you must follow if you wanna do Hard Reset / Factory Reset / Master Reset. Go to Settings > Backup and reset > Factory data reset > Reset device > Erase everything. Remember to backup you personal data and give you best reason before you do this action. If only small problem, like occasionally frozen or unresponsive touchscreen, you can resolve this issue by rebooting the device or removing unnecessary file and applications. How do I reset or clear the password on this Samsung GT-I8190? 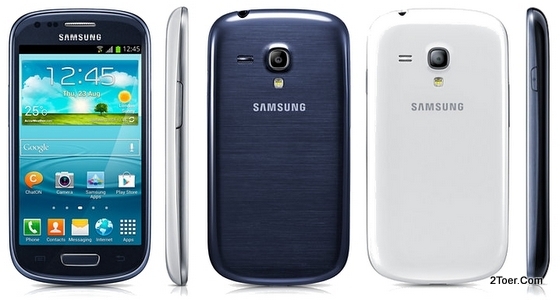 I started using this Samsung Galaxy S III Mini in February 2013. Everything worked fine. However, after I set my password, I could not get past the password entry screen. I kept getting "Password incorrect" error message. It is not the case that I have forgotten my password, so could it be that my password was stored incorrectly or corrupted? I live in the U.S. and bought this phone here not knowing it is a U.K. model and is not supported by Samsung USA. Thank you for your help in resolving this issue and making the mobile work again. You Also, I did the same purchase and it is my first smart Phone, I bought mine through Amazon and the Phone came from Cellular Galaxy out of Lexington, KY. I did ask Samsung UK and they have been most helpful. due to the time difference I'm West Coast Time Wise and the only way I can ask is by email. Good luck with your reset. Even though Samsung Galaxy S III mini isn't supported by Samsung USA, you could ask them -- Samsung Service Center -- at least how to make hard reset via hardware combination. Or, Have you tried to reset your password via Google account in your phone?